Review: Hetty Feather at Nottingham Theatre Royal – East Midlands Theatre. Based on Jacqueline Wilson’s tremendously popular book, the much anticipated Hetty Feather stage show, adapted by Emma Reeves – finally comes keenly knocking at the door of Nottingham Theatre Royal. Begging to be let in on a bitterly cold night, the show receives a right royal welcome, especially by seemingly hundreds of young children in the audience keen to see Hetty, their red haired gutsy heroine, come to life in the theatre. They are not disappointed. 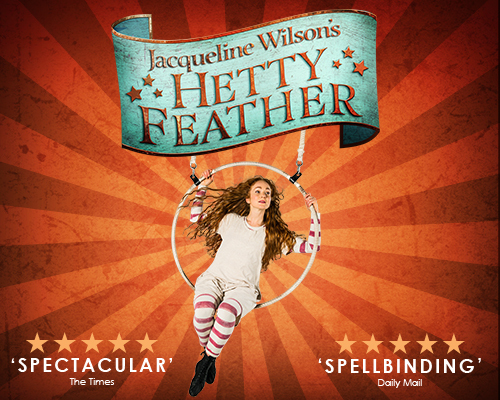 This is a five star production directed by Sally Cookson full of circus style magic, aerial skills, circus tricks, plenty of comedy and heart breaking pathos as foundling child Hetty Feather’s story of winning against the odds comes acrobatically and hypnotically to the stage. This is truly an ensemble piece, full of creativity, fun, imagination and honest playing. Composer Benji Bower’s music is a seamless accompaniment to the piece and adds real atmosphere especially in the moments of high drama and sadness that punctuate the unfolding story. The gifted musicians for this show are Seamus H Carey and Luke Potter. Matt Costain, Sarah Goddard, Mark Kane, Nik Howden, and Nikki Warwick along with the magnetic Phoebe Thomas as Hetty form the talented team of actors. Matt Costain is quietly frightening as Matron Stinky Bottomly. The ensemble not only have to act various roles, sing and dance but a lot of the work is done on ropes and cloth swathes high in the air and the brave results are visually very impressive. Katie Sykes circus ring based set is magnificently versatile. For those who are not familiar with the story they will enjoy a surprisingly emotional and very colourful human story come vividly to life in this Rose Theatre Kingston’s nationally touring production. For those who are fans of the book they will go away ‘picturing’ Hetty’s world in a whole new dynamic way! Very highly recommended. Sardines theatre magazine; my professional writing credits. Opportunities toward new theatre writing with Twisted Dame Productions.